The Franklin Method® uses Dynamic Neuro-cognitive Imagery™, anatomical embodiment and educational skills to create lasting positive change in your body and mind. But what does that mean?? Check out this video for my take on it. The Franklin Method® uses Dynamic Neuro-cognitive Imagery™, anatomical embodiment and educational skills to create lasting positive change in your body and mind. One of the greatest discoveries of the 21st century is the plasticity of the brain; that the lives we live shape the brain we develop. The Franklin Method® is at the forefront of practical neuro-plasticity; showing you how to use your brain to improve your body’s function. Learn how to harness the transforming power of the mind and improve all of your abilities. It all starts with the knowledge that we have the power to change. Franklin Method® workshops are designed to help you understand and embody your natural anatomy and function in a way that in turn improves your function and performance. Students experience increased flexibility (without stretching), strength (without lifting weights), improved balance, stability, mobility, posture, breathing, and more. In addition to all the physical benefits, most report feeling more calm, relaxed, present, and able to focus and think more clearly. All in one class. And it's fun! Experience the power of proprioception + Melt shoulder tension away and improve range of motion in the shoulder joint. Plus learn about how your body knows where it is in space - the proprioceptive nervous system! "How can this all be possible?" you ask? Well, we learn that, too. The Franklin Method® isn't about a series of exercises or postures that you do, imitating a teacher or style. We actually teach you how to create positive change in your movement experience - it's scientifically proven, and it turns out, everyone can learn these skills, and, even better, successfully use them at anytime, free, and easy. 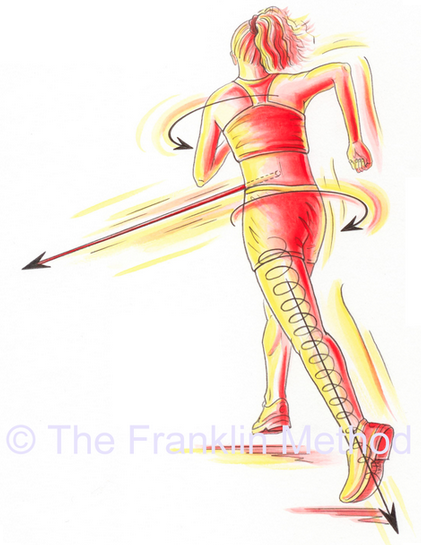 Part of "doing Franklin Method" is learning and practicing how to engage our minds - through anatomical and metaphorical imagery, kinesthetic feedback and self-talk - to quickly and easily improve our movement experience, also improving function, performance, mobility, flexibility, strength, longevity, etc. Improve pelvic floor strength and function as well as overall balance, stability, and posture. Improve shoulder range of motion, function, and strength. Release neck tension and improve overall posture. Experience flexible, supportive, happy feet which translates to happier knees, hips, spine, and overall posture, strength, and performance. Relieve neck tension and improve neck and spine organization, posture, and mobility. Create a strong yet flexible foundation, improve posture, balance, and motion. Offered in Lake Nona. Contact Ann with inquiries. Every class is interactive and experiential, and typically focuses in on a specific area of the body like the pelvis, spine, or foot. We regularly experience that embodying and improving function in one area of the body generally improves function - such as balance, strength, flexibility, coordination - throughout the whole body. We also focus on improving what we do most of the time, such as walking, sitting, standing, breathing, thinking - as we improve those things, we're improving most of our daily experience as well as laying the foundation for even better, healthier physical and mental performance in the other things we do - running, dance, back flips, competitive kickball, headstands. Whatever it may be. Classes and workshops are open to all fitness levels. Well you're just going to have to give it a try and see for yourself. Franklin Method is for literally everyone, but especially if you . . .
Want to improve balance, stability, flexibility, strength, without adding strain and tension to your body. Are an athlete, dancer, yogi, fitness professional, etc (or just a regular joe) and want to improve your overall physical (and mental) function and performance. Just generally want to move, think, and feel better longer. Have you heard? Sitting is the new smoking! Here's a quick Franklin Method experience to help you experience an easy, open upright sitting posture without tension. Give it a try and let me know how it goes! Even More Specific Area - e.g. clavicle, hip joint, intervertebral discs, pelvic ligaments, and on and on - the body is amazing! Click below to join our Franklin Method Mailing List to find out about Upcoming Classes & Workshops + Receive videos and insights to help you move better, think better, & live better. You can also visit the Franklin Method website for more information, resources, and videos.